This antibody detects the CaMKII alpha subunit in both phosphorylated and non phosphorylated forms. Expected reactivity also includes the delta and gamma isoforms but not the beta isoform. Partially purified full length native rat protein. WB: Human, rat and mouse whole brain tissue lysates. Flow Cyt: PC12 cells. 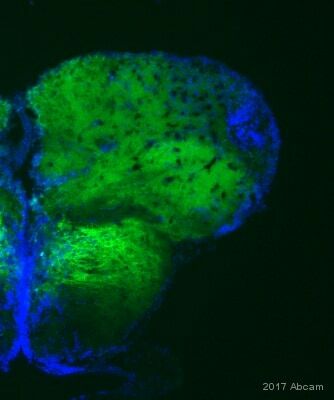 IHC - P: Rat normal brain FFPE tissue sections. Our Abpromise guarantee covers the use of ab22609 in the following tested applications. WB Use a concentration of 1 - 5 µg/ml. Detects a band of approximately 50 kDa (predicted molecular weight: 56 kDa). RIA Use a concentration of 3 - 5 µg/ml. CaM-kinase II (CAMK2) is a prominent kinase in the central nervous system that may function in long-term potentiation and neurotransmitter release. Member of the NMDAR signaling complex in excitatory synapses it may regulate NMDAR-dependent potentiation of the AMPAR and synaptic plasticity. Cell junction > synapse > presynaptic cell membrane. Cell junction > synapse. Postsynaptic lipid rafts. Additional bands at: 100 kDa, 65 kDa, 70 kDa. We are unsure as to the identity of these extra bands. 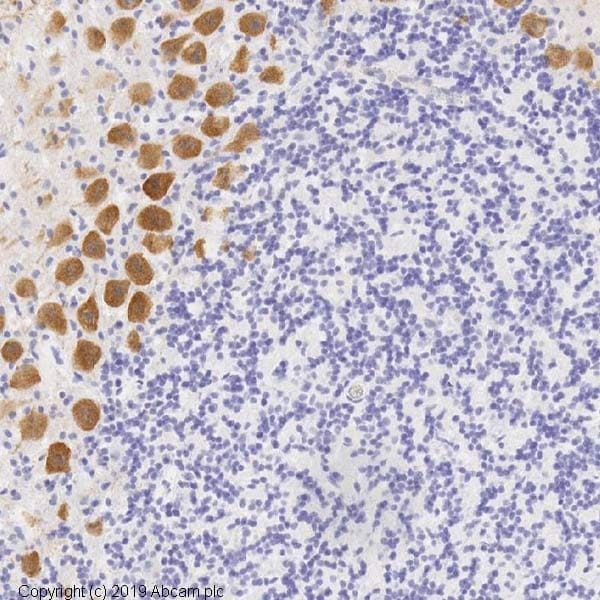 IHC image of ab22609 staining in Rat normal brain (Purkinje cells, cerebellum) formalin fixed paraffin embedded tissue section, performed on a Leica BondTM system using the standard protocol F. The section was pre-treated using heat mediated antigen retrieval with sodium citrate buffer (pH6, epitope retrieval solution 1) for 20 mins. The section was then incubated with ab22609, 1µg/ml, for 15 mins at room temperature and detected using an HRP conjugated compact polymer system. DAB was used as the chromogen. The section was then counterstained with haematoxylin and mounted with DPX. Publishing research using ab22609? Please let us know so that we can cite the reference in this datasheet. Inquiry: I am using the following 3 antibodies (ab22609, ab32678, ab138392), but I am unable to get a clear band at the specified KDa molecular weight. The protein bands of interest are always at a higher MW, with alot of non-specific bands showing. Could you please tell me the protein sequence for the above 3 antibodies so I can BLAST it to look at the sequence homolgy with Bovine Tissues, and find out what the non-specific bands are. if for any reason you are unable to provide the sequence could you please BLAST it on my behalf and send me a report? Many Thanks. The Bovine species for all of these antibodies is predicted. I am sorry we do not hold any bovine specific data. - ab22609; Partially purified full length native rat protein. The full length protein between human and bovine is more than 90% homologous. - ab138392; Synthetic phosphopeptide corresponding to residues surrounding Threonine 287 from the internal region of Human CaMK2 beta gamma delta. 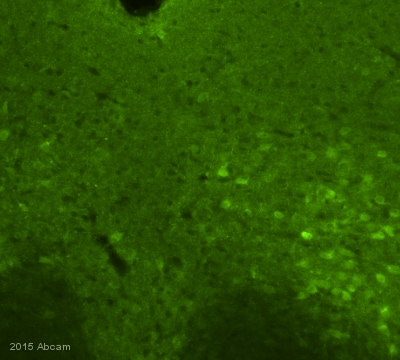 - ab32678; Synthetic phosphopeptide corresponding to amino acids surrounding phospho-286 from Rat brain CaMKII. ab138392 and ab32678 are the phospho specific antibodies. Milk as blocking agent is not recommended for these. Thank you for contacting us. Sandwich ELISA procedures can be difficult to optimize and tested match pair antibodies should be used. This ensures the antibodies are detecting different epitopes on the target protein so they do not interfere with the other antibody binding. Therefore, we are unable to guarantee our antibodies in sandwich ELISA unless they have been specifically tested for sandwich ELISA. At this moment we do not have tested CamKII antibody pairs that can be used in sELISA. However based on the requirement of different epitope specificity I can recommend using ab54925 or ab54926 with ab89197 or ab92332. The antibodies are specific to different part of antigens so these can be used in sELISA. Please be advised that sELISA is not a tested application so these products are not covered under Abpromise guarantee. However I can certainly offer you Abreview discount codes as these products are eligible. The discount codes will give you next primary antibody free of charge if you test these antibodies in sELISA and submit an Abreview. You may have to use one of these antibodies as detection or capture so I can provide you 2 discount codes for 2 products. Let me know if you are interested in obtaining this offer I will then be sending you the discount codes right away. I hope this information is helpful to you. Please do not hesitate to contact us if you need any more advice or information.